Dry to moderate moisture. Upland prairies, meadows, and sometimes woodland openings. Full sun. Sandy or loamy soil. This is an erect, 4″ to 16″ tall, perennial forb that rises in a tuft of 2 to 6 basal leaves and one or more flowering stalks from coarse, fibrous roots. The basal leaves are pale green, linear, flat, 3″ to 10″ long, and 1 ⁄32″ to ⅛″ wide. They are sharply pointed at the tip and are usually hairless. The stem is light green to olive green and may be slightly covered with a whitish waxy substance (glaucous). It is unbranched, distinctly winged, and no more than ⅛″wide. The inflorescence is a solitary flower or a single, unstalked, flattened, fan-shaped cluster (cyme) of 2 to 11 flowers at the end of the stem. The cyme is subtended and partially enclosed by a pair of claw-like bracts (spathe). There is no leaf-like bract below the spathe. The spathe is ½″ to 2 3 ⁄16″ long, green, and not at all or only slightly tinged purple. The outer bract is 1½ to 2 times longer than the inner bract. The margins are thin, membranous, and translucent or transparent. The	margin	of	the	outer	bract	is distinct all the way to the base. The flowers are ½″ to 1″ wide. 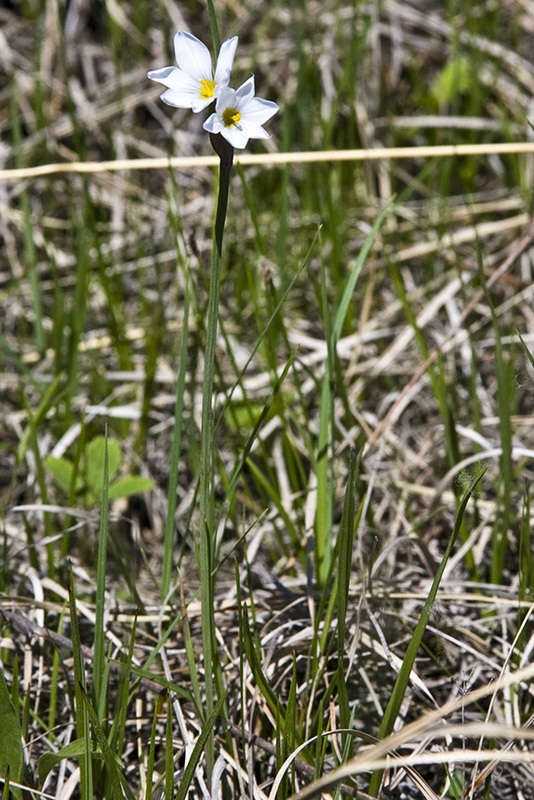 They are borne on thin, thread-like stalks that are about as long as the spathes. They are drooping when in bud, becoming erect when in flower. 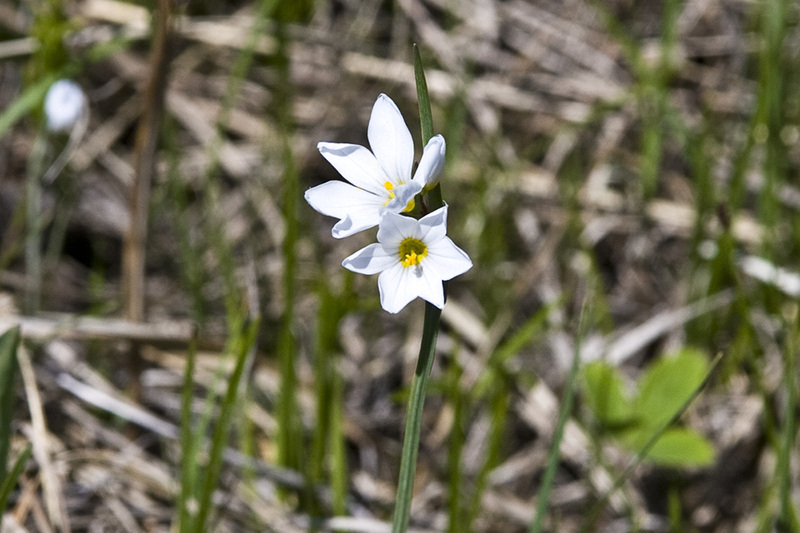 Each flower has 3 petals, 3 petal-like sepals (6 tepals), 3 stamens, and 3 styles. The tepals are spreading, inversely lance-shaped, and ¼″ to ½″ long. They are rounded to notched at the tip with a bristle-like extension at the tip. 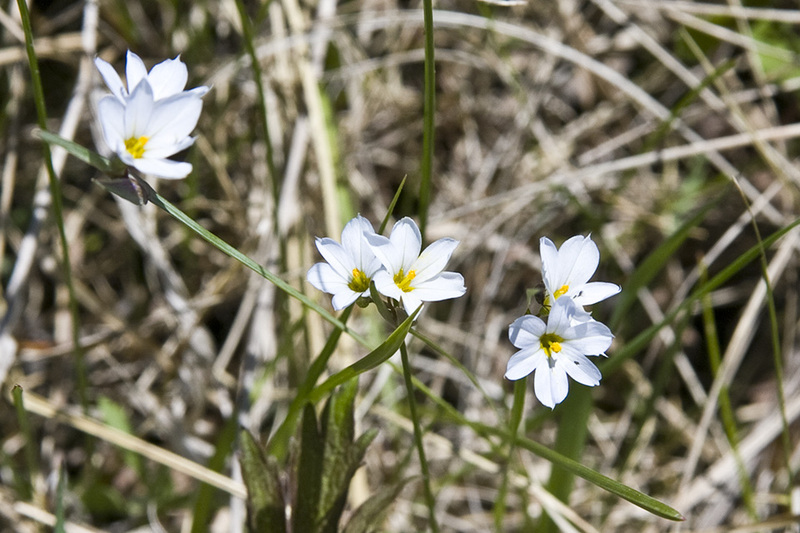 They are pale violet, light blue, or white and are yellow at the base. The stamens have white filaments and yellow anthers. The filaments are fused for most of their length around the styles. The styles extend beyond the anthers. The fruit is an egg-shaped, ⅛″ to 3 ⁄16″ long, light to dark brown capsule with many seeds. 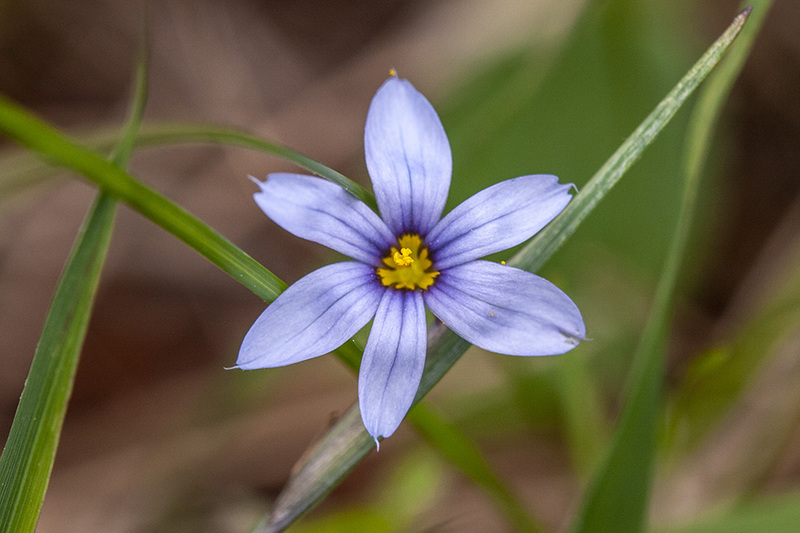 Mountain blue-eyed grass (Sisyrinchium montanum var. montanum) spathe is often strongly tinged purple. The margins of the outer spathe bract are fused for 1 ⁄32″ to ¼″ at the base. The flowers are bluish-violet. 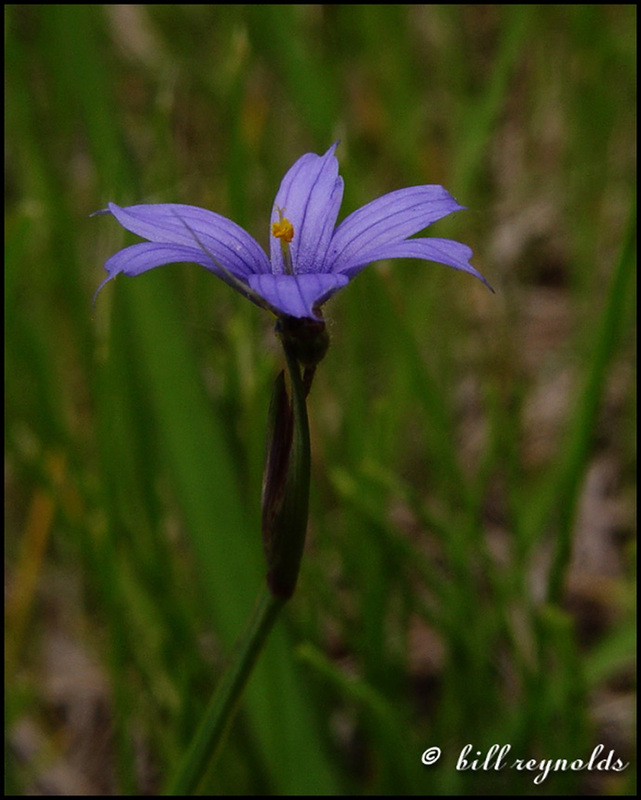 Narrow-leaved blue-eyed-grass (Sisyrinchium angustifolium) leaves and stems are not glaucous. There may be 2 to 4 stalked flower clusters on the stem, causing the stem to appear branched. Contrary to its common name, this plant is not a grass. A branched, flat-topped or convex flower cluster in which the terminal flower opens first and the outermost flowers open last. One or two large bracts that subtend, hood, or sometimes envelope a flower or flower cluster, as with a Jack-in-the-Pulpit.